Mike Ross might be up to his neck in legal troubles, but the actor who plays him is free to try on a different kind of suit. (You'll soon see what I did there.) In fact, since Suits just finished Season 5, actor Patrick J. Adams is taking some time to appear in a totally different sort of project. Reports this week indicate that Adams is heading to DC’s newest comic book-based series, Legends of Tomorrow. However, the role is currently shrouded in mystery. We also know exactly when Patrick J. Adams will be showing up. The character is expected to appear in Legends of Tomorrow’s Season 1 finale, which will hit the schedule on May 19. You don’t have to worry about whether or not the performance will have any effect on the freshman superhero drama getting renewed. That’s because the CW actually already made that decision a couple of weeks ago, renewing Legends of Tomorrow for Season 2, along with bringing back other DC shows The Flash and Arrow. Go ahead and keep your DVR schedule intact for next year. 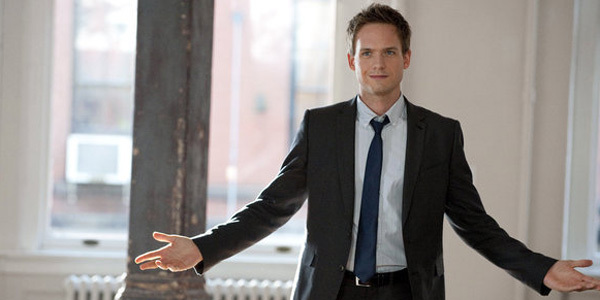 As for Patrick J. Adams’ run on Suits, the future is a little more uncertain. Suits spoilers abound in this paragraph if you aren't caught up. When last we left Adams’ character Mike Ross at the end of Season 5, he took the fall for posing as a lawyer for the last few years. This happened because Sheila Sacz caught wind of his defrauding and totally turned him in. It also happened because Anita Gibbs had a personal problem with Harvey Specter and wanted to make him pay. Mike is expected to still be in prison when the show picks back up, but it's hard to tell how long that plotline will be drawn out during Season 6. In the meantime, he should be pretty recognizable during his stint on Legends of Tomorrow. You can catch new episodes of that series on Thursday nights at 8 p.m. ET. In addition, you can find out what the TV networks have coming up this summer with our TV premiere schedule.